It is happening around us, near Buckden-St Neots. The Proclaim group from St Ives parish have been door-to-door visiting in the village of Knapwell, led by Fr Karol Porczak. Here they tell us of their encouraging and joyful experience. After some hesitation at first, I felt encouraged and confident on the day of evangelization having a clear message, which was given to me, and I wanted to share it with the people I met: Your village is the part of our Parish, we pray for you, Jesus loves you. The rest – how, what if, etc – was left for the guidance of the Holy Spirit. I felt strong support of prayer going on in the church at the same time and big joy in my heart for doing this small bit for the Lord’s glory. This was our first evangelisation mission as “proclaimers”! Only the one long road that is Knapwell and opportunity to get our feet wet despite being the most beautiful of days. In twos we were welcomed, particularly by an Anglican couple, whose initial guard came down, once we introduced ourselves. Everyone was pleased to receive our calling card and promise of prayers. No need for dust to be shaken from sandals. I had a glimpse of what the apostles might have experienced when Jesus sent them out in pairs on an evangelisation mission. At first I was anxious about the reception we would get from each family that we visited, however this soon melted away following the positive encounter we had with Charlie’s family who told us that they were Catholics and that Charlie was actually baptised at Sacred Heart Catholic Church in St Ives. I felt a profound sense of joy after the day’s visits and will definitely participate in future visits. In people we met we experienced three different attitudes. Those who seemed to be satisfied with the lives they had, maybe laughing at us who admitted to believe in non-material reality; they seemed not needing any knocking at their doors. Then there were people who are actively involved in the Catholic or other Christian Church. It seemed that they were built up because of our involvement to share our faith. And finally, the people who said that they are not believers, but we could feel in them that our testimony was touching them. Maybe they are not ready yet for a bigger step towards faith but I hope that our meeting with them might be a spark on this path. I consider the last group the main goal of evangelization and I am asking our Lord for the special graces for them. Opportunities to say that God loves each one of us, ask if any help could be given, offered our prayer card and promise of prayer. Feelings of satisfaction and joy at attempting to spread the Gospel message, I will be with the next happy band of proclaimers. I am very grateful for the group of people who joined me at the beginning of the evangelisation journey in Sacred Heart Parish. Thanks be to the Lord that He provided those parishioners who responded to the call of spreading the Good News in our parish. No doubt that I personally would like to proceed that mission, entrusting it to the Lord towards the needs of the Diocese of East Anglia. It fulfils the request of Our Lady of La Salette: “Make my message known to all my people” at the end of her apparition in 1846. Rev Karol Porczak MS is the Episcopal Vicar for the New Evangelisation and Mission in East Anglia. 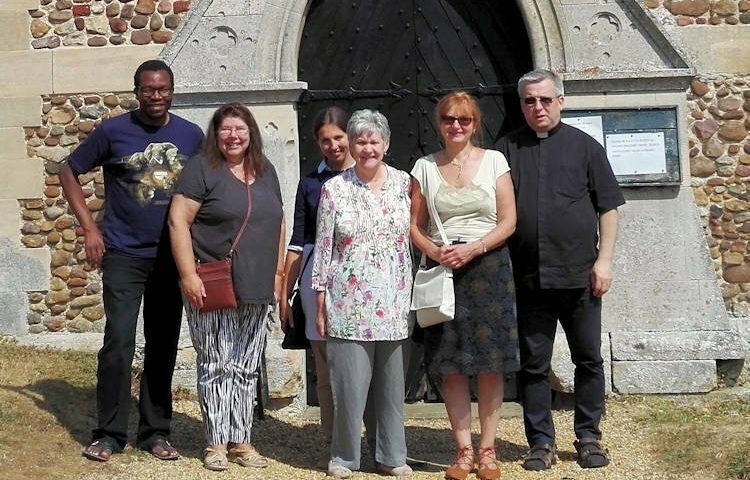 Pictured are the Proclaim Group in Knapwell, from the left: Jeffrey, Jackie, Agata, Elizabeth, Wilhelmina and Fr Karol.